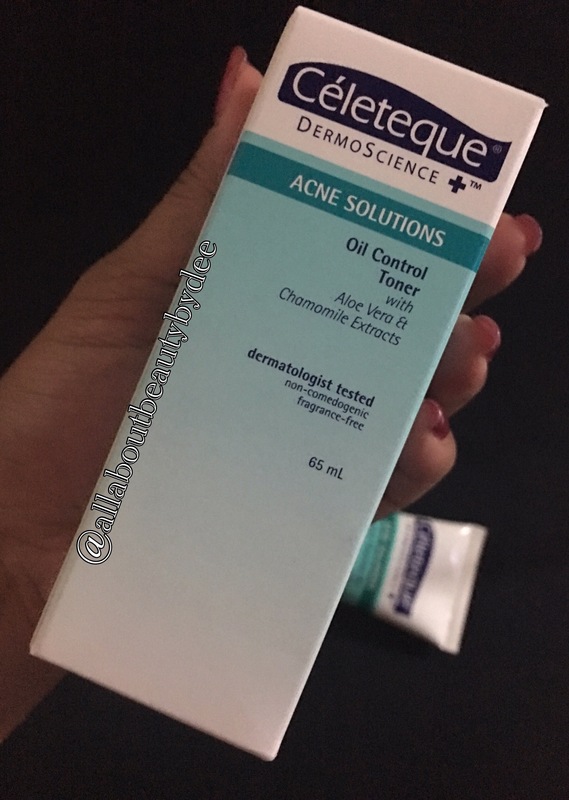 This blog is a full review on CÉLETEQUE DermoScience™ Acne Solutions Oil Control Toner with Aloe Vera and Chamomile Extracts. CÉLETEQUE DermoScience™ Acne Solutions Oil Control Toner has Aloe Vera and Chamomile Extracts that help soothe the skin while removing the last traces of stubborn dirt. Skincare brands have been stepping up their game lately. Celeteque, in particular has a wide variety of skin products that are sold individually or as kits. It offers different products for different skin needs – from brightening, age defying, sun protect and of course, anti-acne. I will be very honest (as always), I only bought this because I was so desperate in getting rid of my breakouts. 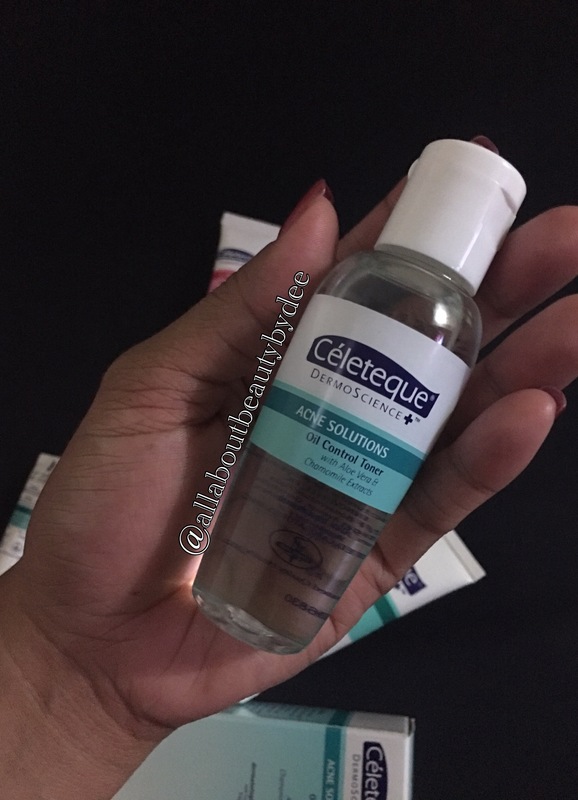 I fell in love with the cleanser and moisturizer from #Celeteque’s acne solutions line so I thought of buying this as well with a heart that’s hoping for faster results. I bought this 65 ml bottle at P72.35 from Mercury Drugstore in Glorietta. The prices can vary depending on the mall/store you buy it from but the price differences do not really make a lot of difference. It also comes in a 125 ml bottle which costs around P120. The plastic bottle was stored in a typical Celeteque box which contains a lot of information on it like the ingredients, how it works, manufacture and expiration date, etc. I have always loved the color choices of the brand and I love that it comes in an easy to open flip cap but I am not over the moon about the whole packaging. It doesn’t look as extravagant as other toner bottles. Really nothing special about the packaging. Moisten cotton with CÉLETEQUE DermoScience™ Acne Solutions Oil Control Toner. Apply to face and neck with gentle upward strokes. The 1st major thumbs down for me is, the smell is too strong and this stings so bad. Do not use it if you have an open wound or cut on your face because it will sting like a b****. I used this for a whole month and tried varied approaches to see its effect and if 1 approach will work better than the others. First week, I used it twice a day – 1 in the afternoon before I apply my makeup and get ready for work and 1 in the morning after a 9-hour graveyard shift. After a week, I noticed that it really dried out my skin. I had dry patches on my chin, forehead and cheeks. I tried using it once a day on the 2nd week! The patches stopped but I can still totally feel my skin so dry. On the 3rd week, I used it with the cleanser and the moisturizer from the same line, thinking it might work best with just Celeteque products. I didn’t notice any significant change. For the 4th week, my usage was not so consistent anymore. In fact, I just really want to finish the bottle so I won’t feel bad about spending money on it. My bottle is not completely empty yet so I think it can last for 1 month to 6 weeks depending on how often you use it and how much you apply. I would strongly recommend this if you have oily skin but if you are like me with combination skin or very dry skin, then you may consider using other options. I am still obsessed with the cleanser and the gel but this one is just not for me! Do you have any product you want me to try and review for you? Let me know by leaving a comment below. Thanks loves and enjoy the rest of your week!